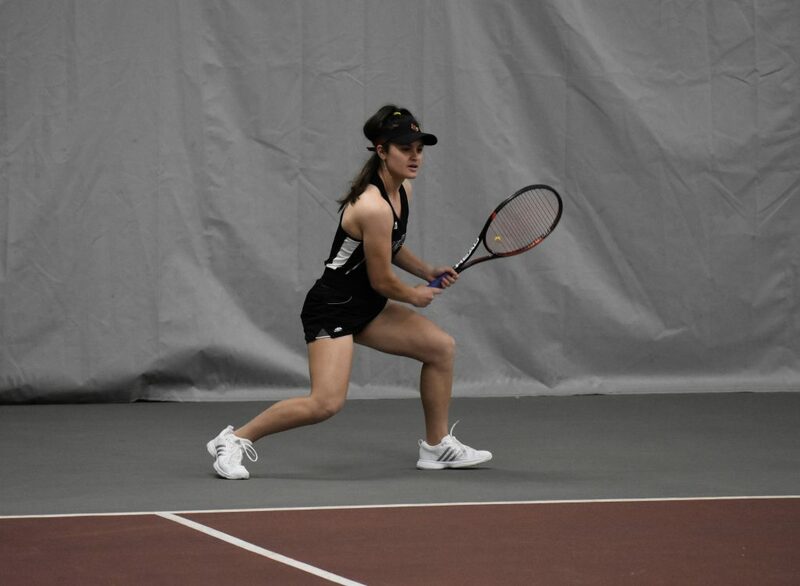 Women’s tennis (10-10) traveled to Virginia Tech (7-12) this Friday, April 5th, only to pick up another tough loss. The Cards fell 4-3, making for their eighth consecutive loss. They currently hold a 2-8 conference record. The doubles lineup consisted of senior Sena Suswam and freshman Dina Chaika at the No. 1 spot, juniors Raven Neely and Diana Wong at the No. 2 spot, and freshman Chloe Hamlin and senior Ola Mally at the No. 3 spot. To start off the match, Suswam and Chaika fell 6-2 to Natalie Novotna and Rita Pinto (VT). Next, Neely and Wong fell 7-6 (4) to Nika Kozar and Nina Sorkin (VT), clinching the doubles point. Hamlin and Mally were defeated by Elizabet Danailova and Samantha Gillas (VT) 7-6 (3). The singles lineup included Suswam at No.1, sophomore Nikolina Jovic at No. 2, Mally at No. 3, Neely at No. 4, Hamlin at No. 5, and Wong at the No. 6 spot. Court one finished first as Suswam was defeated by 116th-ranked Natalie Novotna (VT) 6-3, 6-2. Hamlin gave the Cards their first point with her 6-2, 1-6, 6-1 win over Rita Pinto (VT). Jovic went on to even the score by defeating Nika Kozar (VT) 7-5, 6-3. Things took a turn when Wong lost a hard-fought battle to Nina Sorkin (VT) 2-6, 6-3, 2-6. Mally also lost her match in the third set to Samantha Gillas (VT), clinching the match for Virginia Tech (6-1, 4-6, 5-7). Neely won her match soon after on court four against Elizabet Danailova (VT), but it was too late for the Cards (6-3, 7-5, 7-5). Women’s tennis takes on Virginia this Sunday, April 7th at 11am at the Sheridan Snyder Tennis Center.